The new TAG Heuer Aquaracer 300M plunges the iconic sports brand into the nautical realm. 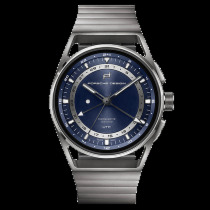 Based on the original 2000 Aquaracer launched in 1982, this version retains the enigma of the early classic with an updated design and new specifications. 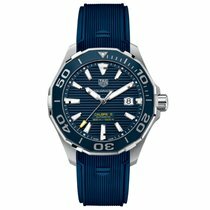 Precise, robust, and made to be in the water: That’s the Aquaracer from TAG Heuer. The Aquaracer collection treads the border between style and professionalism. This model has six features of a professional dive watch enclosed in a substantial case, together with a newly designed bezel. Perfect for sailing and true to its name, the Aquaracer 300M is water resistant to 300 meters. The intuitive unidirectional turning bezel measures impeccable time limits. 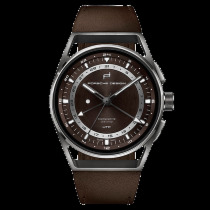 It also comes with a built-in safety feature that ensures the remaining time for a countdown can only be reduced by accidental movements to the bezel, never increased. Because of this, wearers will always maintain a strong grip on time with the TAG Heuer 300M Aquaracer. Additionally, the new bezel has squared edges and flat facets placed between its six studs for easy rotation. The confident design is expressive of the brand’s sports legacy. 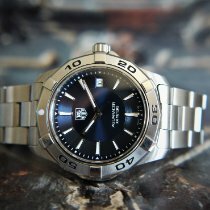 Even at a glance, the TAG Heuer Aquaracer 300M asserts its strength as a timepiece in fine-brushed steel with a blue ring and dial. The side of the crown reveals the oversize screw with double-gaskets. 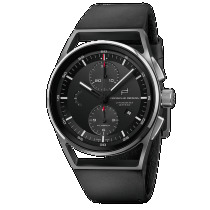 This design is water-resistant and simple to grasp and rotate. The responsive hour, minute, and second hands also sweep across the face in tune with each revolution; so keeping and changing the time on the fly is always effortless. 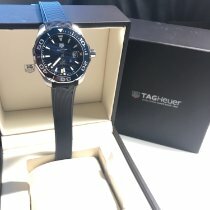 Aquaracer 300M from TAG Heuer also features an anti-reflective treatment as well as luminescent hands and markers that make it easy to read underwater or at night. The date window at 3 o’clock is similarly legible and responsive to rapid date corrections. Finally, it has a crystal cut from a single slab of polished sapphire. Created by fusing and crystallizing alumina, the resulting gemstone is so hard that it can only be scratched by a diamond. Tested to extremes and manufactured by experts in Switzerland, TAG Heuer Aquaracer 300M watches are the benchmark in timekeeping. 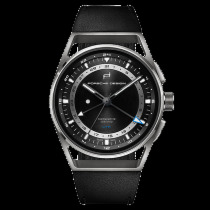 The robustness of the watch’s exterior is driven by the elegant mechanisms hidden away from view in the case. The Aquaracer’s heart is a Swiss made automatic caliber 5 that runs with near infallible precision; with a balance frequency of 28,800 vibrations per hour (4 Hz) and a power reserve of up to 38h, this movement’s performance is worthy of admiration. At 26 mm (11 ½'''), it is also perfectly constructed, especially in an iteration that uses 25 to 26 bearing rubies. 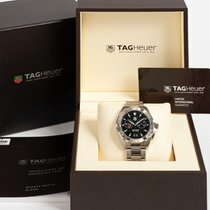 Last but not least, the movement features a delicate Côtes de Genève pattern and is engraved with the words: “TAG Heuer—Caliber 5—Swiss Made”. 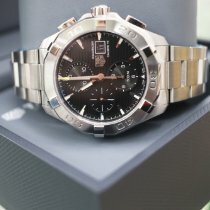 Taken as a whole, the TAG Heuer Aquaracer 300M is a distinguished watch on the inside and out.